The Judicial Power Project lists fifty supposedly problematic judicial decisions. Although a small number of these are private law cases, the vast majority concern administrative law and human rights. It is encouraging to see constitutional questions debated in the public sphere, and even more so to see one of the contributors wrestle with legal doctrine. Nevertheless, the manner in which the Judicial Power Project represents those fifty decisions leaves a lot to be desired. It is not just that the accounts they present are subjective and contestable (although they clearly are, as Mark Elliott’s response demonstrates). It is that the Project’s accounts of many of the cases are objectively misleading, because they ignore critical aspects of context. In this post we focus on their treatment of Anisminic, the 44th case on their list (paired with In re Racal which we do not discuss here for reasons of space). We focus on Anisminic both because of the totemic position this case occupies in histories of public law, and because of the stridency of the Judicial Power Project’s criticism, accusing the Law Lords of “judicial adventurism” by sidestepping the clear words of statute. This characterisation is objectively wrong at two levels. Firstly, in terms of doctrine, Anisminic neither invented nor significantly extended the common law tradition on reading down ouster clauses. On the contrary, authorities of the highest standing at the time understood Anisminic to be an orthodox application of existing doctrine. The true significance of Anisminic, we argue, lies elsewhere. Secondly, and far more fundamentally, when we consider the decision in Anisminic in the context of its aftermath, it assumes a very different colour from that which the Judicial Power Project gives it. Far from being an instance of judicial overreach, Anisminic offers a powerful example of how the judiciary, legislature, and an engaged citizenry can work together to improve the quality of administrative processes. We now turn to the details of each of these points. If legal rights cannot be brought before the courts, the rule of law collapses. The judges, well understanding this, have for 300 years firmly set their faces against such provisions and have, to put it bluntly, refused to apply them. What is now needed is a thorough study of the problem from all angles, with a view to making exceptions where they are justifiable, but not elsewhere. Meanwhile, the Government should respect the wise decision of the House of Lords, which puts justice first. In so doing the House of Lords was following and reaffirming a long established principle that sections such as that which is mentioned above do not prevent the Courts from investigating the question whether the so called determination is a nullity and, if they find that it is, so declaring and giving whatever consequential relief may be appropriate. This is because Anisminic’s contribution to the development of public law did not lie in its reading down of “no certiorari” clauses, but in its attempt to elaborate on what this long-established principle meant in the context of the legal needs of the late 1960s. As we discuss in detail in a forthcoming piece (to appear in the LQR in 2017), there was at the time a genuine fear – seen particularly clearly in the discussions surrounding the Whyatt and Goodfellow reports – that administrative bodies, in pursuit of the entirely laudable goals that the post-War state had taken on, would give insufficient consideration to the interests of individual persons with whom they came into contact (the Whyatt Report’s famous “farmer with two acres and a cow”). This concern crossed party lines – Labour and Conservative lawyers were to be found on both sides of the debate. Parliament’s ability to provide an effective remedy was limited. As JAG Griffith put it in his contribution to Law Reform Now, Parliamentary control of the executive was more akin to the manner in which the banks of a river control its flow than the sense in which a driver controls a car. In practice, Parliament could do little in relation to individual instances of hardship, and many such instances went unredressed. Allowing “no certiorari” clauses in practice did not mean respecting Parliamentary sovereignty. It meant accepting a state of things where there were no practical checks on executive action. Contrary to the Project’s interpretation, the solution proposed by Anisminic placed Parliamentary sovereignty front and centre. The starting point of Anisminic was that powers conferred on subordinate authorities by Parliament were not usually unfettered. The question which any purported exercise of a power by a public authority necessarily raised, therefore, was whether the public authority had been given that power. And the answer to this question lay in a separation between matters which Parliament had intended to entrust to the authority in question, and matters on which Parliament had already expressed its opinion on, and from which the authority could not constitutionally dissent. The reason the determination by the authority in Anisminic was a nullity was that it sought, impermissibly, to do the latter – by denying recourse to a class of persons who Parliament had decided should get recourse. Parliament could permit the authority to dissent from its view if it wished, and it could frame clauses absolutely excluding judicial review if it wished. However, the House of Lords pointed out (rightly) that such a situation would be so exceptional in constitutional terms that exceptionally clear wording would be expected. It would require more than the mere use of a form of words which was substantially equivalent to forms long understood to have a much more limited effect. Objectively viewed, therefore, Anisminic represents neither “judicial adventurism” nor an attack on Parliamentary sovereignty. It represents, instead, an attempt to understand what this idea – that only Parliament (not the executive, and not the judiciary) possesses unfettered power – means when it came to a claim by an executive body to possess unbounded power. The Project’s description of Anisminic becomes even more problematic when we look at the case’s actual effects. Far from being an example of judicial overreach, Anisminic presents an outstanding example of how a judicial decision can improve the quality of administrative decision when all parties approach its implications in a spirit of commitment to the rule of law. (4) An Order in Council under the said section 3 may confer power on the Foreign Compensation Commission to determine any question as to the construction or interpretation of any provision with respect to claims falling to be determined by them which is included in any Order made under that section after the passing of this Act; and any determination of the Commission by virtue of this subsection shall be included among the determinations to which section 4(4) of the Foreign Compensation Act, 1950 (determinations of the Commission not to be questioned in courts of law) applies. The House of Commons, once again following the Burmah Oil and Prince Frederick examples, is being asked to follow a course which is contrary to justice. We are to have this tribunal and whatever it says is to be right. It can go off its head provided it follows the procedure. The amendment nevertheless passed the House of Commons and went to the House of Lords. At this point, the legal profession and legal academics intervened in the debate. Professor Wade wrote the letter we have quoted from above, and the Presidents of the Bar Council and the Law Society wrote their joint contribution which we have also quoted. Both supported the House of Lords’ decision, and argued in the strongest terms that the proposed amendment was contrary to the rule of law. The Presidents of the Bar Council and the Law Society went one step further, and proposed a possible solution: the introduction of a statutory appeal to a court of law. On 4 February 1969, the Bill was debated in the House of Lords. The debate was nuanced and impressive, involving the participation of Lords Denning and Wilberforce as well as other individuals. The suggestion of a statutory appeal was considered, and won support from a broad range of peers (although not of the government). Viscount Dilhorne finally moved an amendment to create precisely such an appeal to the Court of Appeal, with no further appeal to the House of Lords. The amendment was carried, and became part of the final Act. It is hard to square this history with the account presented by the Project – that Anisminic was an arrogation by the judges of power that Parliament had clearly intended to deny them. The subsequent history makes it clear that Anisminic was an example of the precise opposite: the judiciary, Parliament, and engaged members of civil society working successfully together to resolve a problem created by a statute, and which threatened a core legal principle. Historically seen, Anisminic is a shining example of the UK’s constitutional institutions functioning at their best. To portray it otherwise is wrong to the point of misleading. This points to a broader issue with the way the role of the judiciary is often debated. As lawyers, we have a tendency to work with ideal types – idealised representations of institutions, rather than their messy empirical reality. When it comes to the debate about judicial powers, however, there has been a regrettable tendency to work with an idealised representation of Parliament, juxtaposed against an almost cynically realist representation of the judiciary. This does not make for productive discussion. Any debate should be conducted in the light of the actual strengths and limitations of the institutions in question, to see how we can best structure their common working. Otherwise we run the danger of grounding our thought in a grave misunderstanding not just about the judiciary itself, but also about the constitutional principles that underlie its exercise of jurisdiction. The mistaken account of Anisminic on the Project’s website instantiates this danger. The idea that executive powers are not unfettered (which, as a contextual reading reveals, is what Anisminic actually said) is far less objectionable than the idea that judicial power is unfettered (which Anisminic can be read to say, but only if you take it out of context), and represents a far more important constitutional principle. When debating an issue as important as the constitutional role of the judiciary, we cannot afford to let our proposals be shaped by errors as egregious as these. What was Entick v Carrington actually about? One of the attractions of doing research in legal history is the feeling of exhilaration that can accompany a successful hunt for a document that you know existed at some time, and which you think you just might manage to find with a little bit of luck. 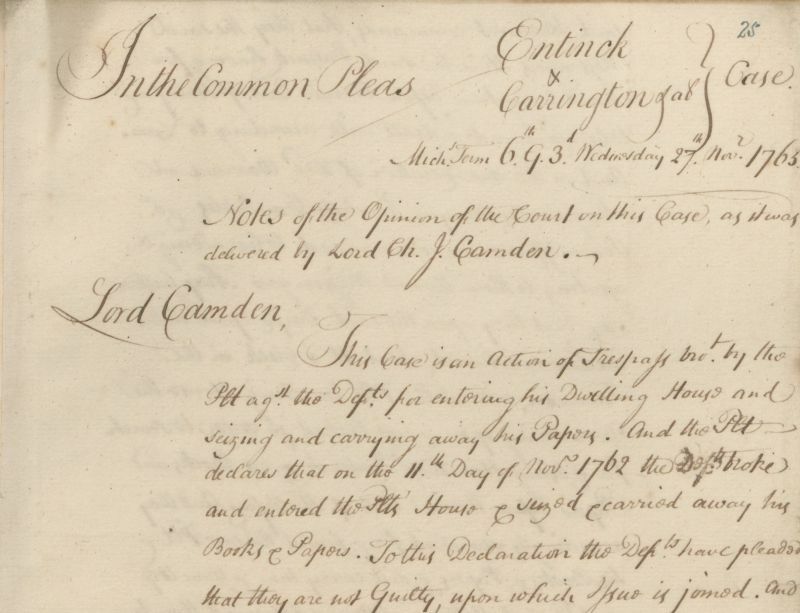 Earlier this year, I had that precise feeling when I found a manuscript account of the decision in Entick v Carrington (1765) 19 ST 1029 after having hunted for it for several months. The manuscript was prepared for the solicitor general at the time, and the version that has survived is a fair copy of notes prepared in court by a shorthand writer. The manuscript is potentially important, as the provenance of the more familiar account published in the State Trials is unknown. Hargrave was deliberately cagey about how he got hold of a copy in his introduction to the report, and there is little chance we will ever discover its precise mode of transmission. This manuscript, in contrast, was produced by someone who was actually in court, for a law officer of the Crown who had an obvious interest in as accurate an account of the decision as possible. That suggests that it deserves to be taken seriously. The manuscript for the most part follows the State Trials version quite closely, but there are a couple of differences which are very significant. I will be discussing the manuscript account of the decision, and these differences, in some detail at SLS in a fortnight, but there are two points I will make at this stage. Firstly, the political context comes across far more clearly in this version. Even though the words are not particularly different, the differences we do see are significant. Lord Camden was an active politician, as was Mansfield, and the two were on opposite sides of the faultlines that ran through Whig politics – Camden was on Pitt’s side, while Mansfield sided with Newcastle. The discussion of the powers of the Secretary of State, in particular, acquire a particularly strong significance when you read them in the light of the sharply divided positions that were being taken at the time on the rising institution of Cabinet, and of the power exercised by the Court Whigs. And here it must be observed, that no subject whatever is excepted, because both Houses of Parliament have lately resolved, there is no Privilege in the case of a seditious Libel, and therefore their Books and Papers may be seized in the same way. And I am able to affirm that this sort of Warrant, upon a late Occasion has been executed in its utmost Latitude, for in the Case of Wilkes and Wood, when the Messengers were executing that Warrant, they boggled when they came to his private Desks & Bureau, and they sent to the Secretary of State to know what they should do, and whether they must take all the Papers & Writings? And the Secretary of State sent word – all must be taken. And they then took all they could find, and swept the whole, and Mr. Wilkes’ private Pocket Book filled up the mouth of the sack. And I have since been told by the ablest and most experienced messenger, and who is best acquainted with the Practice, that he was obliged to do every thing commanded in the Warrant, by virtue of his Oathe, or otherwise he perjured himself, and that on those Occasions he generally swept Alle. As this Jurisdiction of the Secretary of State is so extensive, therefore the Power ought to be as clean as it is extensive. It does not appear in our Law Books at all, that he has this Power. For the sake of the security of the subjects in general, in cases of Execution of Seizures at common law, every Man by the Common Law is obliged to give up his Right for the sake of Justice and the general Good, but then that is only for a Time till the Demands for which they are seized are satisfied. But by the Law of England every Invasion of a Man’s private property is a Trespass and subject to an Action; though not a Farthing Damage done; for no man can set his Foot upon my Land and even tread any Grass, without committing a Trespass, and being liable to an Action for it. This is proved by every Declaration in Trespass, and is every Day’s Experience; and in that Case, the Defendant if he admits the fact he is then obliged to shew some positive Law or some unavoidable necessity has excused Him. The Jury have nothing to do with more than the Fact, and if the Defendant shews a Justification in Point of Law, the Judges are to look into their Books, to see if the Defendant is justified either by Statute or the Common Law, and if upon looking, nothing is found, and the Books are silent on that Head, the Silence of the Books is conclusive Evidence against the Defendant, that He is not right in his Justification. According to this way of Reasoning it is incumbent on the Defendant to show, by what Law this Trespass is warranted. Private Papers are the only way of concealing a man’s most valuable Secrets either in his Profession or any other way, and are his dearest Property. Where private Papers are carried away, the Secrets contained in them may be discovered. Whence then does the Secretary of State derive this Power? Is there any Law that gives him such a Power as this? I cannot satisfy myself that there is, for I see none. Then ’tis too much for me to justify that Practice. The Lockean quote about property, had it been a part of the judgment, would have appeared at the end of the first paragraph I’ve quoted. As you can see, the entire passage hangs together extremely well without it and, in my view, even makes more sense in the context. The title of my SLS talk (at the second plenary session on 2 September) is “Republican liberty and the common law: The 18th century context of Entick v Carrington“. I’m editing the manuscript, and hope to make it available online shortly after SLS (time permitting).